Now a growing number of us have taken delivery of our P400e's, what is everyone actually achieving in electric only (EV) range? Already 11.000 km driven and 25 km is minimum and 40 km maximum. Had mine for a week and a half now, and looking at the app I'm ranging between 11 & 21 EV miles per day. Is definitely getting better though.......maybe because we are starting to suss it out. Can I ask what EV range other users are seeing when their cars are fully charged? Ours typically shows about 23 miles.............what about the 31 that Land Rover promised us? I’m looking for some advice before I take delivery of my car next week. Which public charging cable do you recommend? I will be getting 32A, but does it make a difference if I get a 3phase cable or not? Also from experience is the coil lead better? They promised 50km. Pretty close on almost fully charged. I don't own the car yet - it's at the dealer currently waiting for the CoC. But this figure may change as I experienced with my Tesla. After a full decharge of the battery the system recalculates this value based on you actuals (Tesla). 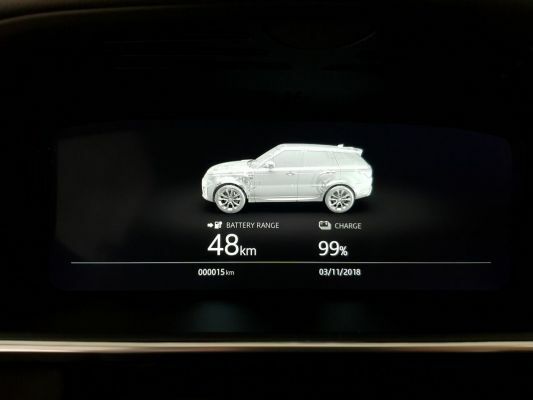 So if you reach each time only 30 km on a single charge, the system may show after some time a different number for a full charge than when the car was brand new (like mine). Most public charging stations offer 3 phase. Charging speed varies from 7.4kWh on single phase towards 22kWh on 3 phase. Had my car for 6 months, 6000 miles. If charging from empty, I get 31 miles on the dash. If topping up a part charge it will only ever go to about 22-25 miles.